In a seemingly unending tide of “smart” devices, a smart frying pan called Pantelligent completed its Kickstarter shipping late last year. It pairs with a smartphone or tablet running the Pantelligent app to deliver temperature information from a sensor in the pan. 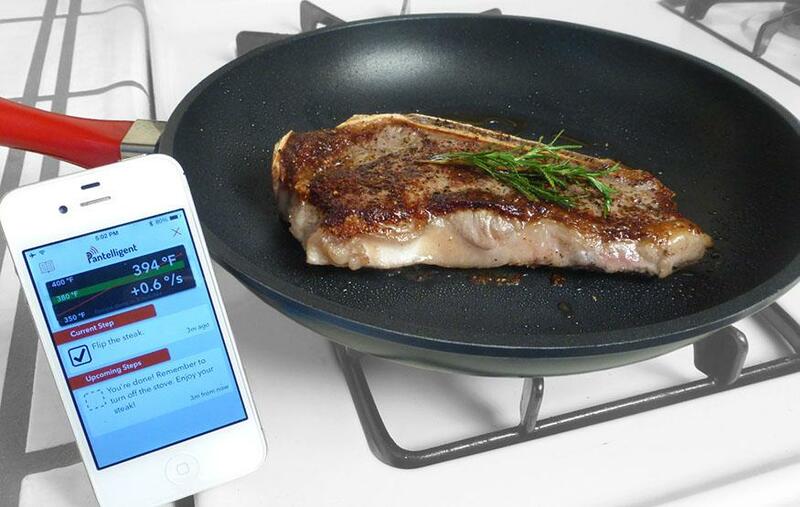 The app then can tell you when to flip or stir what’s cooking, when to add ingredients and when to adjust heat. Because directly monitoring the heat of the pan allows for more precise control, Pantelligent alleges that meals will taste much better. Meals can be customised in the app – for example, when cooking a steak you can choose how you want it cooked from rare to well-done. Recipes include salmon, mushroom risotto, scallops and zucchini pancakes, among many others. The 12-inch frying pan’s sensor will work on any gas or electric stovetop, but does not work with induction stovetops. Pantelligent’s app works on both iOS and Android, and there’s even a companion app for Pebble smartwatches. It is available on their website for USD$239 – a high price for a frying pan, but how many have a temperature sensor?